We have lost a lot of nature in the past three hundred years – in both senses of the word lost. We have lost nature in the sense that much nature has been destroyed: where there was a tree, there is a house; where there was a creek, there is a pipe and a parking lot….But we have also lost nature in another sense. We have misplaced it. We have hidden nature from ourselves. Our mistake has been thinking that nature is something ‘out there,’ far away. We watch it on TV, we read about it in glossy magazines. We imagine a place, somewhere distant, wild and free, a place with no people and no roads and no fences and no power lines, untouched by humanity’s great grubby hands, unchanging except for the season’s turn. …For decades people have unquestioningly accepted the idea that our goal is to preserve nature in its pristine, prehuman state. But many scientists have come to see this as an outdated dream that thwarts bold new plans to save the environment and prevents us from having a fuller relationship with nature. Humans have changed the landscape they inhabit since prehistory, and climate change means even the remotest places now bear the fingerprints of humanity…. We must move beyond our romantic notions of pristine wilderness and replace them with the concept of a global, half-wild rambunctious garden, tended by us. 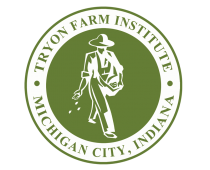 Throughout this annual report (view the entire report here) you’ll find varied and numerous examples of the volunteers and Members of Tryon Farm Institute collaborating to fulfill the organization’s Mission, contributing to a diverse program of conservation demonstration, environmental education, and idea exchange. Thank you to all our volunteers, donors, and sponsors that have made the accomplishments of this past year possible. We are grateful!